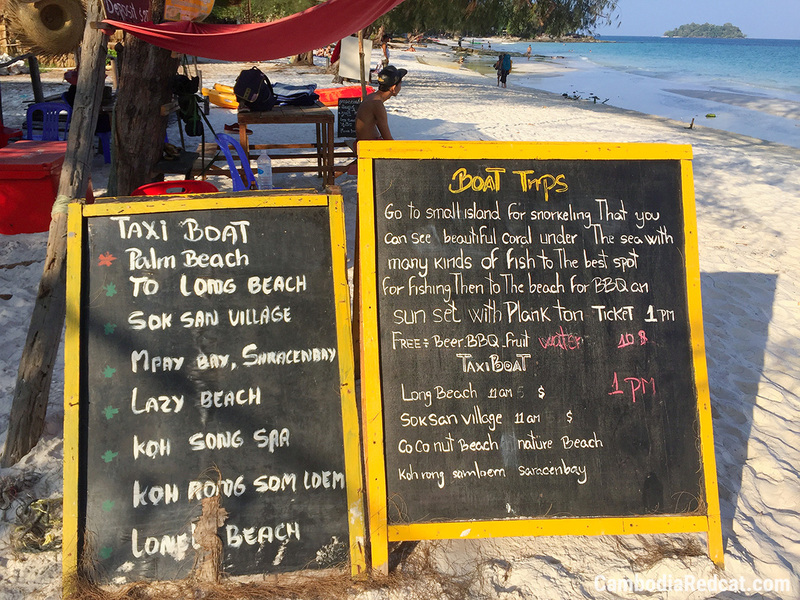 Koh Rong – Paradise or Overrated? Let me tell you one thing right off the bat: Koh Rong is not only the most famous island in Cambodia, it is also the most beautiful island in Cambodia. The question is: Is it really that kind of paradise island everyone is dreaming of or simply overrated by the tourism board and other marketing channels like mainstream travel guides? It is just fair to question that because there aren’t many islands in Cambodia at all, in fact there are only four islands that are visited by over 95% of all tourists every year (and those numbers are only a fraction of what is the norm in Thailand): Koh Rong, Koh Rong Samloem (the smaller neighboring island), Koh Kong and Koh Thmei. You can do a quick google image search of all those islands if you don’t believe me, but there is a reason why they started building most of the bungalows on Koh Rong. 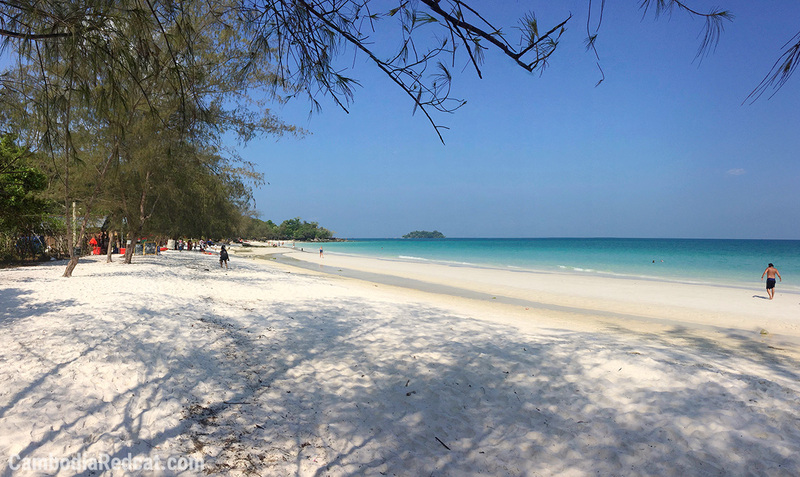 Is Koh Rong worth all the hype? I think best way to answer this question is to tell you about my experiences. To tell you my story. You may already know from my report on the boat trip from Sihanoukville to Koh Rong that the journey wasn’t that pleasant at all and that I threw up nine times the following day. However, during my first afternoon I felt alright and a feeling of huge excitement came over me the moment I stepped out of the boat. It was extremely hot, just like in Sihanoukville, but at least there was a light breeze of wind. I walked along the beach walk on Tui Beach looking for a bungalow, that’s not just where the ferry pier but also most of the guesthouses, restaurants, bars and shops are located. “Beach walk” is actually the wrong word for it as it was completely unpaved and the sand was deep making it impossible to walk in normal pace. But to the right was that beautiful beach with perfectly clean and turquoise water that made me feel great. I had a look at a couple of bungalows and eventually took one right on the beach. I don’t even remember the name, there were no big signs or such, I just remember that the owner was British and gave me a 5 USD discount for the 35 USD bungalow because I paid for 2 nights. These are actually among the better bungalows on Koh Rong but basically not much in there, just a bed with mosquito net, a light (but no power points, need to charge at the bar), a trash can and a bathroom (room may be the wrong word for it) with a cold shower, toilet without flush (water bucket), basin and one mirror. Yes, you can get some better quality like at Monkey Island or Paradise Bungalows but then you are paying at least 80 USD a night for slightly better standard. Not really good value for money I thought and since I was planning on having a few drinks at night (and throwing up from my previous bumpy boat ride) I didn’t really require much comfort, anyway. At that time it was already 4 o’clock in the afternoon so I stayed by my bungalow, enjoyed the beautiful view to the beach and went for a swim at 5pm, just one hour before sunset. After I came back from playing in the water (literally, I met a group of four Cambodians who were enthusiastically playing with their plastic ball and invited me to join them), I took a shower and started walking back towards the ferry pier where most of the restaurants and bars are located. 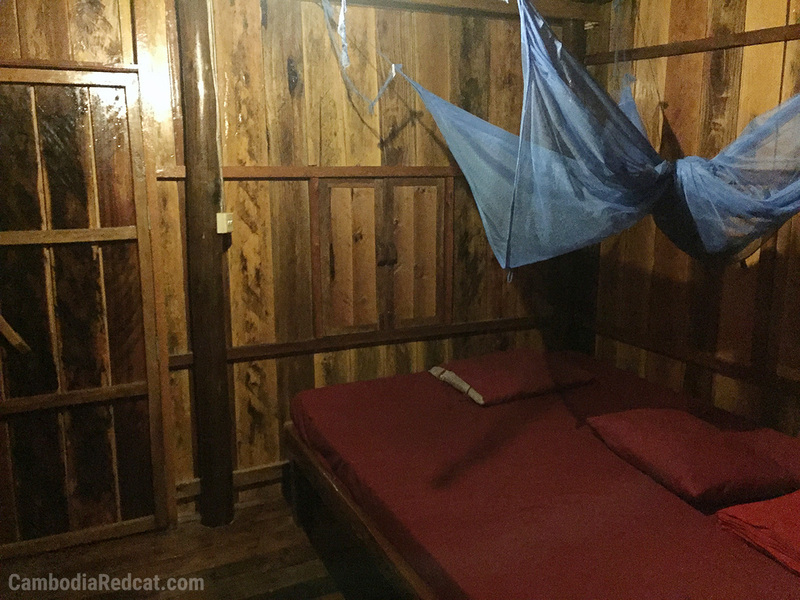 More on that in my guide to the nightlife and girls on Koh Rong. So as already mentioned, I got quite sick during the night due to the bumpy boat ride and felt miserable for more than half of my second day. 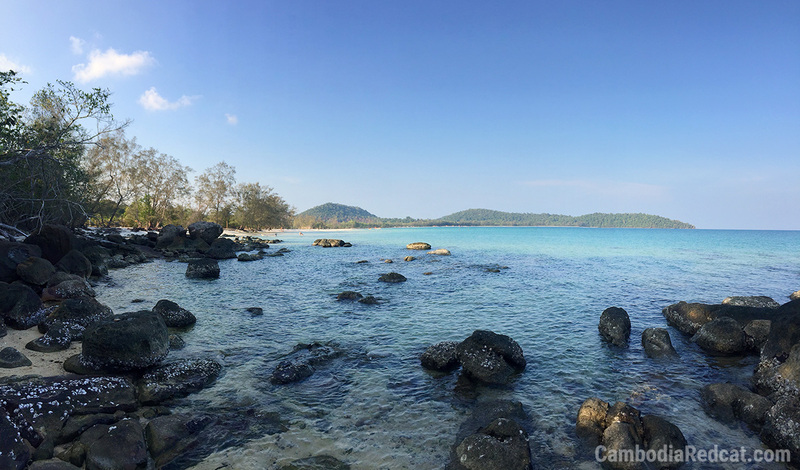 It was already 4pm when I felt a little better and got out of the bamboo chair on the terrace of my bungalow and decided to take a walk to the second most famous place on Koh Rong after Tui Beach: Long Set Beach. You will see these signs on several spots on Tui Beach. The problem is (in my opinion) that they are usually being organized by foreigners and to be more precise: Young kids under 30. I inquired at one place and the girl told me that the island hopping tour was just 10 USD including dinner and drinks. The trip starts at 1pm and ends around 8pm. They are visiting a few islands including Sunset Beach on Koh Rong Samloem on a long tail boat with about 5-10 other people and it’s always so much fun. She went on telling me how drunk everyone was the last time and how much fun it was. You can decide for yourself if you think it would be fun to spend 7 hours on a tiny boat with a bunch of hippies – but I didn’t think so and so I didn’t do it. Well, I couldn’t have done it anyway since I was sick for the better part of the day. Another popular tourist activity on Koh Rong is Zip Lining in the interior of the island, just inquire at one of the travel booths. And one other nice place to visit is the Sky Bar, they have lots and lots of steps leading up the hill (and quite funny and encouraging signs along the way) and the view over Tui Beach, Koh Rong and neighboring Koh Rong Samloem is the best you can get. Unfortunately I didn’t take a photo there because I thought I would be coming back for sunset – but I didn’t. I think you got a good impression of how I enjoyed my 2-night trip to Koh Rong (except from the vomiting part). 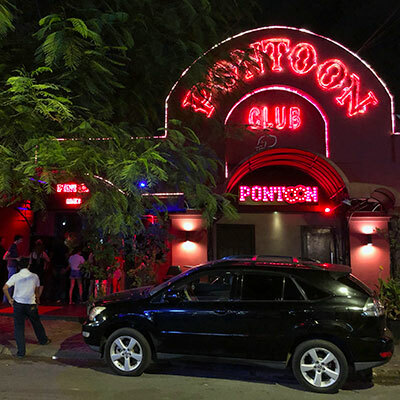 However, I’m sure if I stayed longer than that I would be extremely bored and even on my second night out in the bars I couldn’t really enjoy it because there were just so many hippies around, and absolutely no Cambodian girls to meet. A lot of them are even living here and working in the bars. The Australian father-sun couple I met on my ferry ride back to Sihanoukville shared the same opinion. He brought it right to the point: “This island is a dead end.” Still, it’s enjoyable for one, maximum two nights on the beautiful beaches – nothing less and nothing more than that.